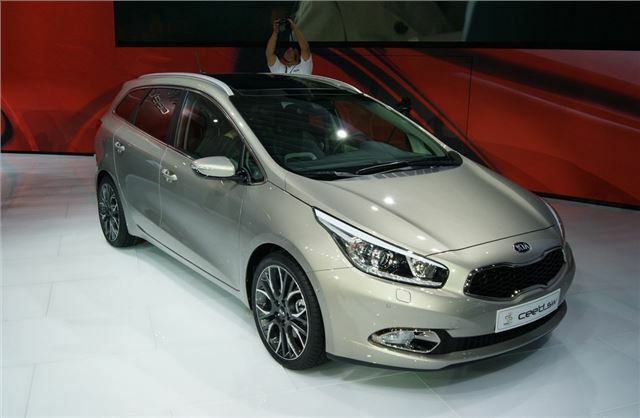 The second generation Kia Cee’d has been unveiled at the Geneva Motor Show today. Both five-door hatchback and SW (estate) body styles of the model, which has been developed in Europe, have been shown. It goes on sale in summer 2012, although the UK specific dates and prices are to be announced. Like its predecessor, it will be built in Europe, and Kia says it will be more sophisticated, more efficient and more engaging to drive than the outgoing model. It's also longer and lower, with a more streamlined design. The overall design is narrower by 10mm, but the front and rear track are both wider, which should make for a more stable car through corners and improved stability. The styling has been heavily influenced by wind tunnel testing to improve aerodynamics and efficiency. The engine range consists of 1.4-litre and 1.6-litre petrol engines, with 100PS and 135PS respectively, plus a 1.6-litre diesel with either 110PS or 128PS. All will be offered with the option of a dual clutch gearbox. Kia anticipates that the diesels will be the most popular, with its 260Nm of torque, choice of six speed manual or auto, 11.0 second 0-62mph sprint time and emissions from as low as 97g/km. A driver oriented cabin features an iPod connection, a selection of trims including chrome, piano black and metal, with different coloured upholstery options. Leather is offered in higher spec models. Key equipment includes LED running lights, HID headlights and parallel parking assist. More specific information on the UK model, including engines and equipment, will be available soon. Lovely looking vihicle, but do u do a 14 crdi diesel in the estate model?